In Istanbul, you will not be able to miss the big mosques which dominate the city skyline – so massive they are that they have become an attraction in itself and many hotels and restaurants are selling their rooftop terrace views when promoting their menu and accommodation. 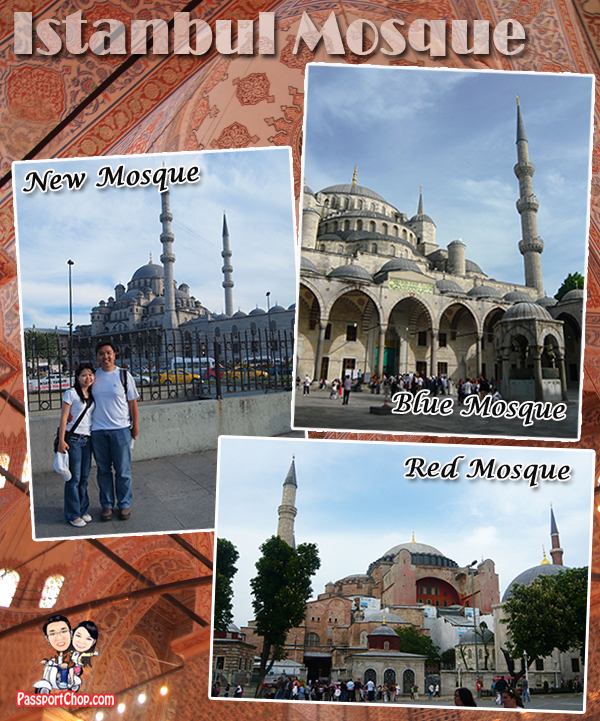 There are 3 key mosques in Istanbul with very distinguishable names – Blue, Red and New Mosque. 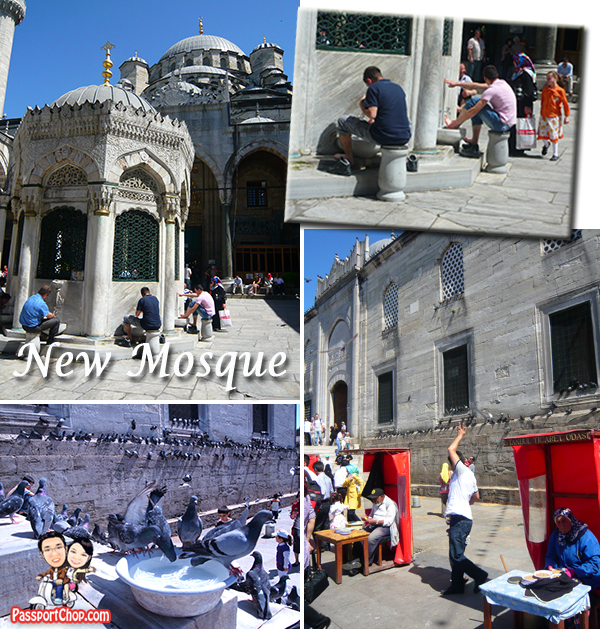 Only in Istanbul can something as old as 600 years be called a New Mosque. The Blue Mosque is one of the must-see sight in Istanbul – it’s free and if you have only time to see one mosque, this will do just fine. It gets really crowded especially in the mornings when busloads of tourists drop here for a quick tour of the place. 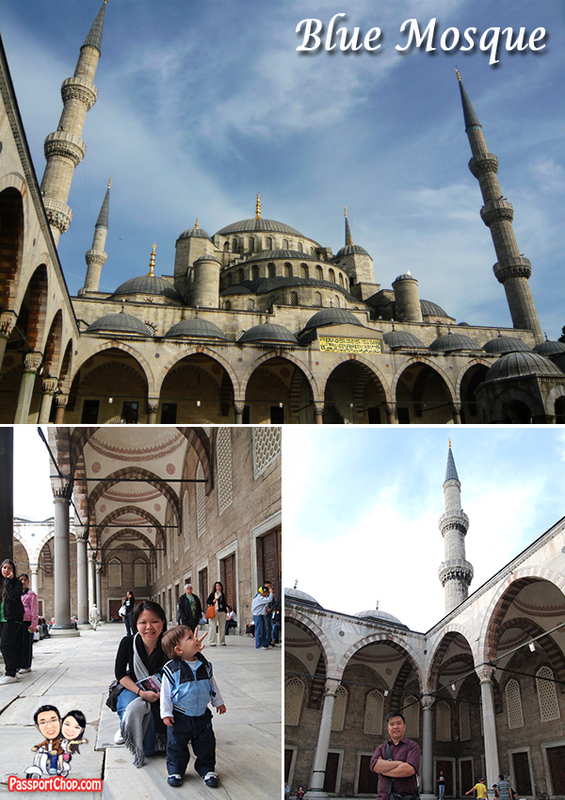 The Blue Mosque has itself become a landmark from which most groups gather at the end of the day for their next journey. So be prepared for the crowds and watch your wallet. 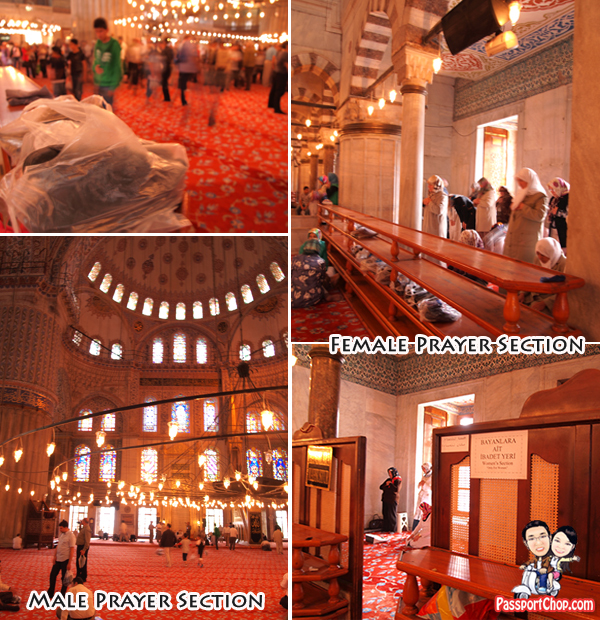 The inside of the mosque is just majestic – there is a female praying section and the main praying area (the centre of the mosque is for male Muslims only – non-Muslims are not allowed in. There are some ground rules you have to follow before you can enter the mosque – this applies universally to other mosques in Istanbul. 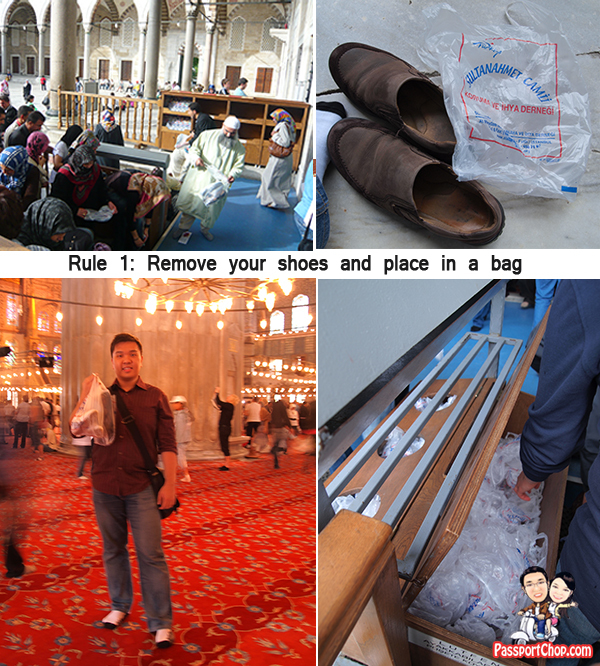 First, you have to remove your shoes and put it in one of the plastic bags provided by the mosque (alternatively, you can bring your own bag to carry it). The bags are reused so be prepared for some smell as you bring your shoes around the mosque. 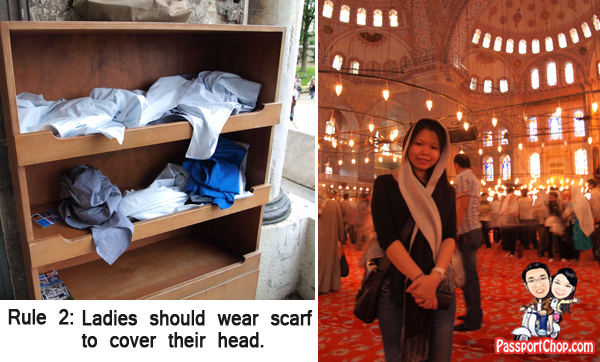 For ladies, you have to cover your head with a scarf – no miniskirts, sleeveless shirt (cover exposed parts with scarf. Scarves are also provided but bring your own if you are not keen on sharing. The other more popular mosque is the New Mosque which is at the Eminou area, just outside the Spice Bazaar – similar ground rules apply when you want to enter this mosque. This is slightly smaller and there is huge crowd of pigeons gathering outside (the situation is not helped by the pigeon feed sellers where tourists could buy feed for these pigeons). Also note that there are public taps for devout Muslims to wash their hands and feets before entering the mosque as part of their cleansing process. 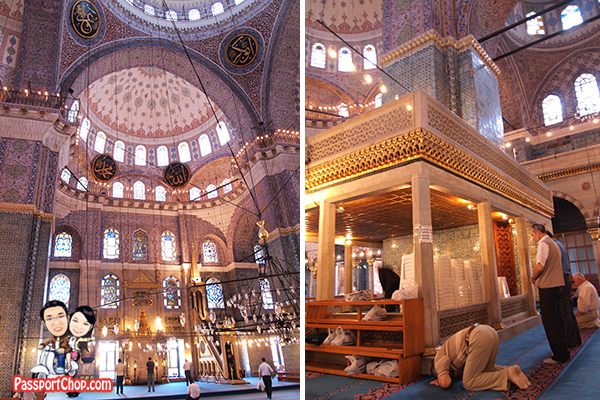 The interior of the New Mosque is organised very similarly to the Blue Mosque too – while smaller, its just as majestic. Very beautiful photos and a very detailed trip! thanks for sharing this beautiful travel with us, definitely a best travel deal for me! This article is certainly thoughtful. You are a very thoughtful author. The images are very attractive and making me feel visit the place the next trip I plan . The description also seems interesting and I really want to see myself in those images you displayed. I am really fascinated towards the place more as I see many pigeons all over the place flying here and there, it looks amazing. A very well written article in detail. I liked reading it ,even the tiny things are mentioned I appreciate your work. Keep sharing your experience . I am glad viewing your work.